Wall Street collided with Main Street over the past year in the Sacramento market as institutional investors like Blackstone made mass purchases. Here is an image in the Natomas area of Sacramento to illustrate the homes that Blackstone bought in this neighborhood over a period of twelve months. Keep in mind these are only purchases listed in Tax Records, which is important since Realist data at times has only included about 50% or so of Blackstone’s acquisitions. It’s amazing to see so many new rentals by one investment fund, don’t you think? 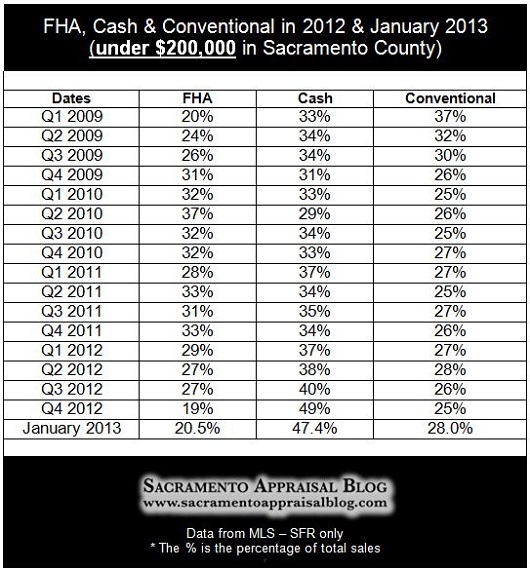 While it is striking to see mass cash purchases, it’s also important to consider there has been less cash in the Sacramento real estate market lately – just as the graph below helps illustrate. As housing inventory has been climbing and price increases have begun to slow down, investors have seemed to take their foot of the gas pedal a bit over the past 60+ days. It seems like Blackstone has been slowing down too based on what I’ve been hearing from agents and also observing data-wise over the past few months (less sales over the past 90 days compared to the previous quarter). In my mind it is important what Blackstone does since they have been a huge player in the market. In short, this is worth watching over time. Any thoughts, questions or stories to share? Feel free to comment below.